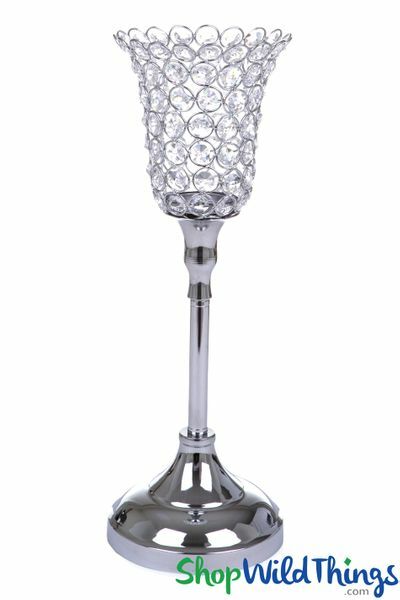 Home > Lighting > Candle Holders > Beaded Real Crystals Candle Holder - Tulip Shape - "Prestige" - Silver 13.5" - BUY MORE, SAVE MORE! 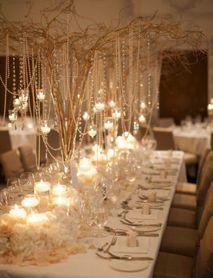 Just like a real tulip, our new Prestige Beaded Real Crystals Tulip Candle Holder is exquisite and classy! 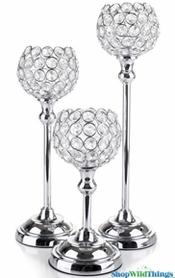 The shiny silver pedestal rises to support a 5" tall tulip shaped goblet gleaming with GENUINE crystal beads. This candle holder is 13.5" tall and the goblet gracefully curves up and out to a 4.5" wide opening and at the bottom is a metal votive cup, 1.5" in diameter and .5" tall. The stunning crystal beads are faceted for maximum shine and they have superb clarity. Our crystal beads are real crystal, not acrylic and they are faceted on all sides. You will find sellers who "sneak" in plastic beads or mix acrylic with glass beads. We are fanatical that this is NOT done on our products. Simply add a flameless LED tea light or votive candle and your average centerpiece quickly transforms into a sophisticated and refined showpiece! This candle holder is classy on its own but place it on a mirror with our other matching pedestal goblets, crystal gem pillar holders and votive cups, stand back and admire the magnificence! This candle holder weighs 1.5 lbs.